English and in Greek and implications are made that instruction methods should be language specific. from achieving reading and writing fluency. Papadopoulos, 2008; Hatzidaki et al., 2011). appear to be the core deficit in dyslexic children. times, the old spelling has been largely retained”. /e/ is represented by two graphemes: ε, αι. different sounds) is very rare in Greek, but it can also be found. Hence, t can be sounded as t in some instances and d in others. difficulties in deep orthographies such as English. English, on the other hand, is known to be a deviant language. lish orthography has been identified as a contributing factor. 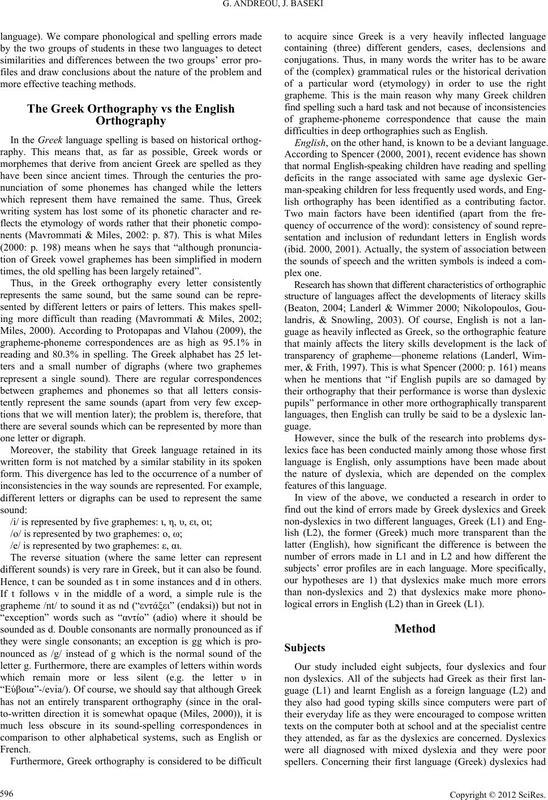 logical errors in English (L2) than in Greek (L1). lian Spelling Test—they all attained a low (above average) score. ing-writing, listening, speaking and reading test scores. and had been attending English classes for about four years. background with dyslexics participated in mainstream education. the writing activity was not the same in Greek and English. words not in the students’ writing vocabularies”. recording tool for experimental research on the process of writing. be examined and presented in future papers. grapheme transpositions and vowel or consonant alterations. instead of “parties” in English. 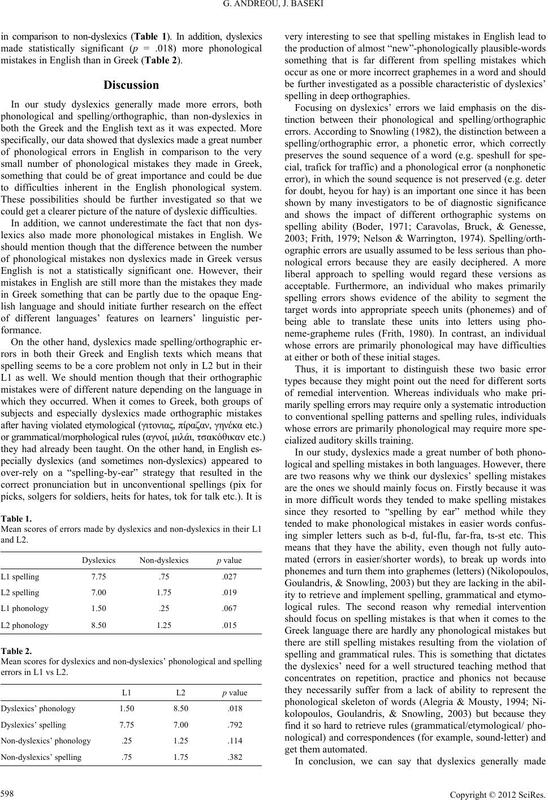 different types of errors (phonological vs. spelling/orthographic). The analysis was done with the SPSS statistical programme. mistakes in English than in Greek (Table 2). to difficulties inherent in the English phonological system. 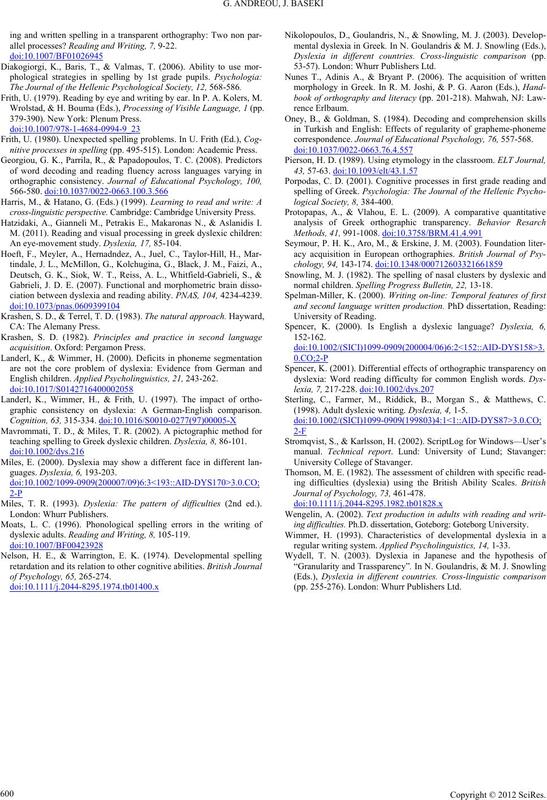 could get a clearer picture of the nature of dyslexic difficulties. errors in L1 vs L2. at either or both of these initial stages. orthographic system that poses difficulties for young learners. the kind of spelling/orthographic mistakes our subjects made. in Greek as well but these mistakes were not of the same type. manding historic orthography and grammatical rules. forms met later in the lesson. errors while they made very few phonological errors in Greek. method when it comes to Greek grammar and spelling. both languages so that the effect of the task would come out. York: Holt, Rinehart and Winston, Inc.
tario: The Ontario Institute for Studies in Education. ences? Brain and Language, 98, 347-351. Studies of Reading, 7, 209-333.
comparisons (pp. 157-180). London: Whurr Publishers Ltd.
Journal of Psychology, 55, 75-84.
allel processes? Reading and Writing, 7, 9-22. The Journal of the Hellenic Psychological Society, 12, 568-586. Frith, U. (1979). Reading by eye and writing by ear. In P. A. Kolers, M.
Wrolstad, & H. Bouma (Eds. ), Processing of Visible Language, 1 (pp. 379-390). New York: Plenum Press. nitive processes in s pelling (pp. 495-515). London: Academic Press. cross-linguistic perspective. Cambridge: Cambridge University Press. Hatzidaki, A., Gianneli M., Petrakis E., Makaronas N., & Aslanidis I. An eye-movement study. Dyslexia, 17, 85-104.
ciation between dyslexia and reading ability. PNAS, 104, 4234-4239. English children. 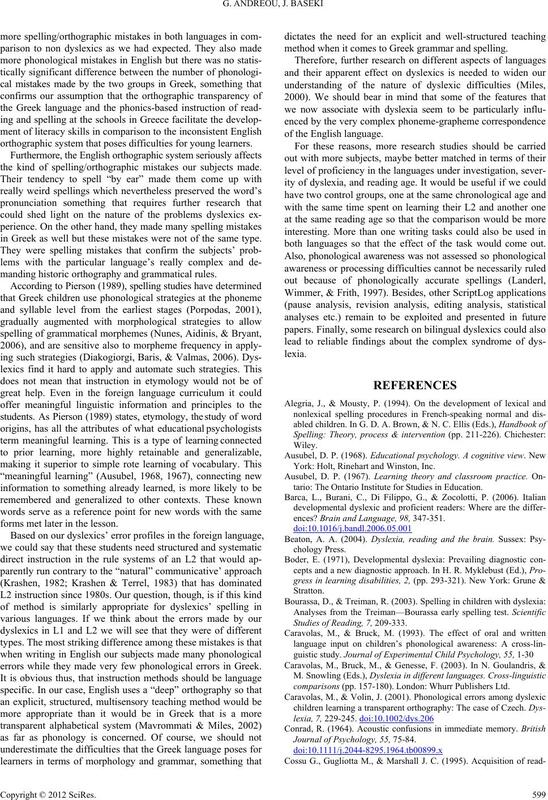 A pp l ie d Psycholinguistics, 21, 243-262.
graphic consistency on dyslexia: A German-English comparison. 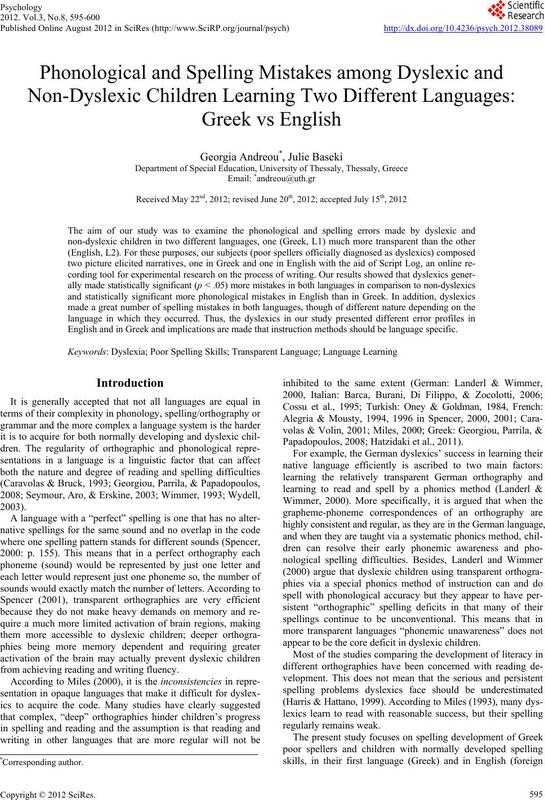 teaching spelling to Greek dyslexic children. Dyslexia, 8, 86-101. Miles, T. R. (1993). Dyslexia: The pattern of difficulties (2nd ed.). dyslexic adults. Reading and Writing, 8, 105-119. Dyslexia in different countries. Cross-linguistic comparison (pp. 53-57). London: Whurr Publishers Ltd.
correspondence. Journal of Educational Psychology, 76, 557-568.
normal children. Spelling Progress Bulletin, 22, 13-18. Sterling, C., Farmer, M., Riddick, B., Morgan S., & Matthews, C.
(1998). Adult dyslexic writing. Dys lexia, 4, 1-5. Journal of Psychology, 73, 461-478.
ing difficulties. Ph.D. dissertation, Goteborg: Goteborg University. regular writing system. Applied Psycholinguistics, 14, 1-33. (pp. 255-276). London: Whurr Publishers Ltd.